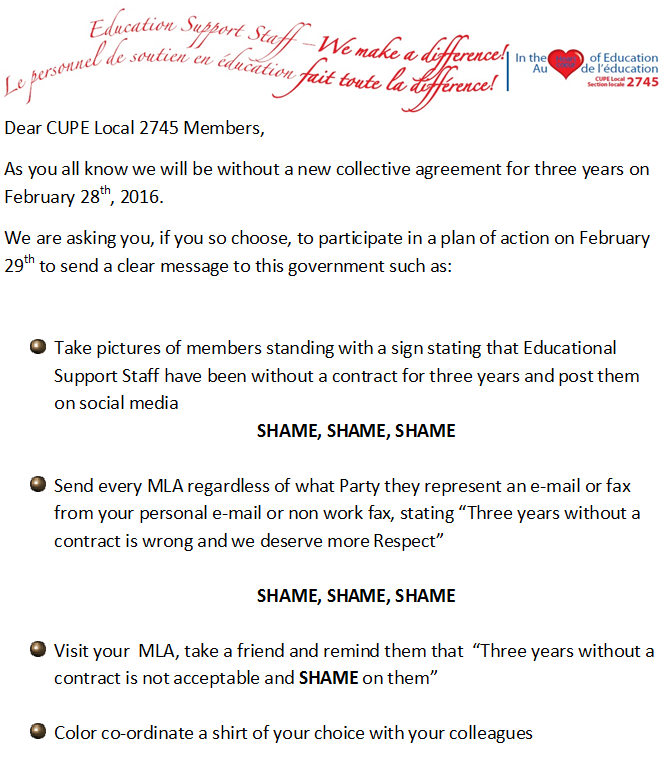 Thank You CUPE 2745 for your support and participation in our achievement of a new collective agreement! 93 % in favor of accepting our contract. Thank you to everyone for coming out to cast your vote , and supporting the negotiating team. 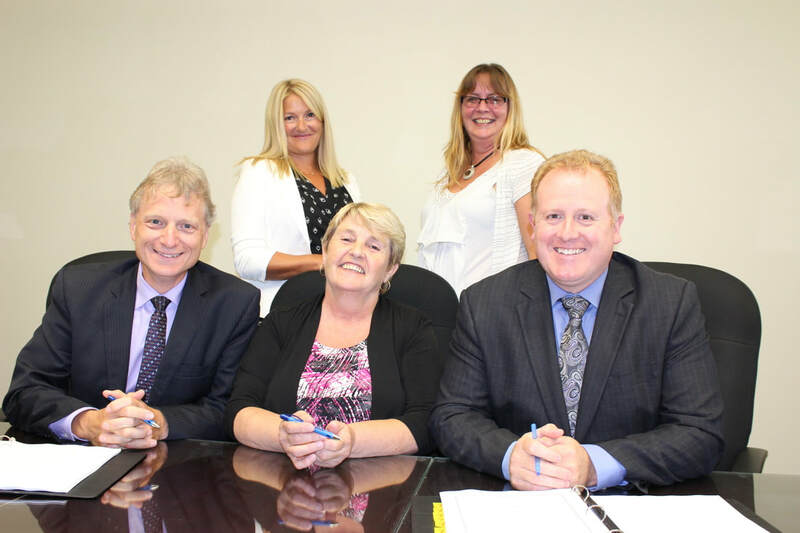 Our new collective agreement was signed on September 8, 2016. Together we are strong ! There have been a number of questions and concerns that have surfaced so we are going to try to clear them up regarding the upcoming negotiation tour. collected afterwards. They cannot go out to the public. 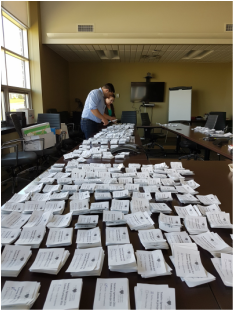 · The presentation meetings ALL start at 6pm with voting to follow commencing approximately 7pm. heard today about the Pay Equity we have been waiting for the Classification and Compensation Dept. of the government to send us the spreadsheet that will be presented at the meetings. It was our hope to have these meetings sooner but we needed to get the work done, ensure it was accurate and we do not control others workload! 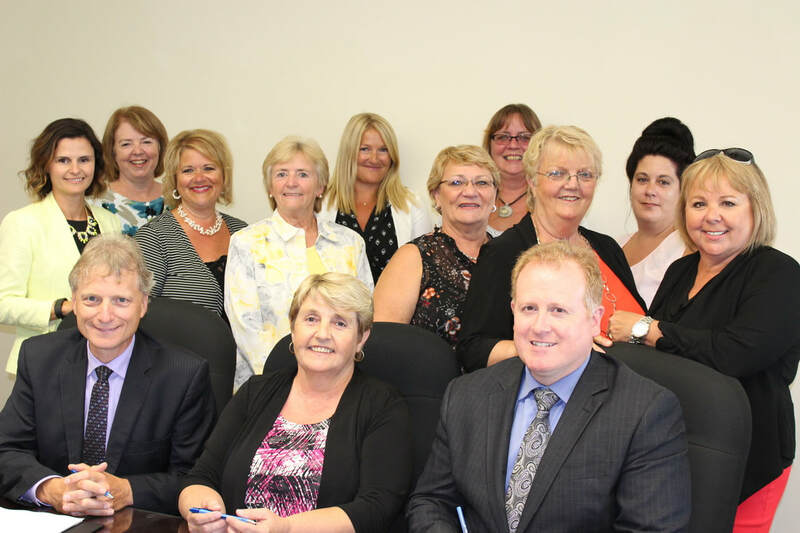 It is with appreciation and recognition that I acknowledge the patience, hard work, determination and commitment of our negotiation team in reaching a tentative agreement. The support and confidence that you, members, instilled in us to keep pushing allowed us to forge ahead. It has been a long, hard, 3 years plus, but we have finally achieved an end result. We can not release details at this time, but they will be out soon and we will be coming out for a ratification vote. We have been called back to the table today and further details will follow. 25, 2016. The officer is Geoffrey Bladon. 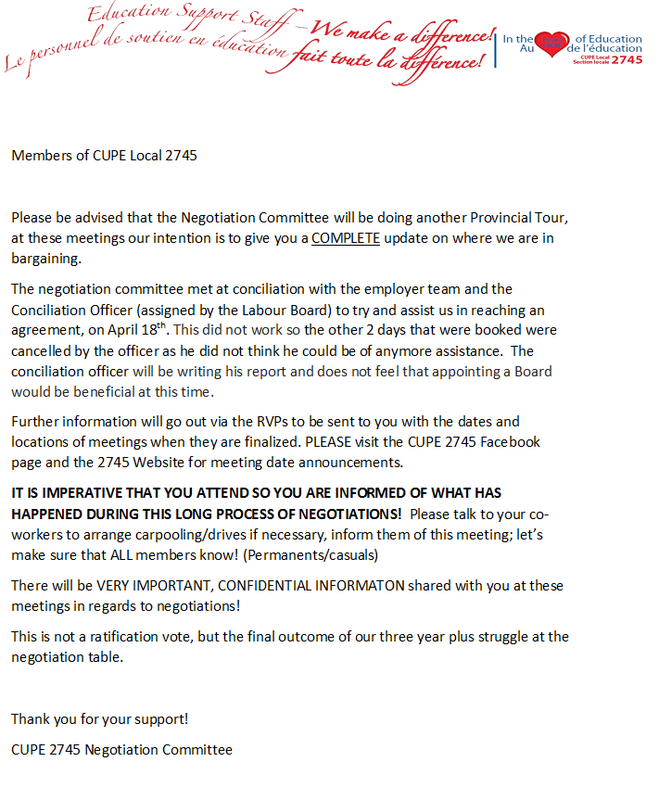 Members of CUPE 2745, we feel and hear your frustrations but we are in the process of conciliation. We have agreed to an extension until March 18 due to a family emergency of one of the team members. We will resume the process as soon as possible after that date. We are still awaiting word on a conciliator. the Board of Management. We are in constant contact with the Director of Human Resources regarding the status of Pay Equity. Thank you for your continuous support and patience! We are returning to the negotiation table on February 8 and have the whole week set aside for it.